Pacific International Suites Parramatta provides beautifully appointed hotel suites and apartment accommodation in central Parramatta, only 25 minutes from Sydney CBD. Offering a range of quality hotel facilities, this accommodation in Sydney is perfect for both corporate and leisure tourists. 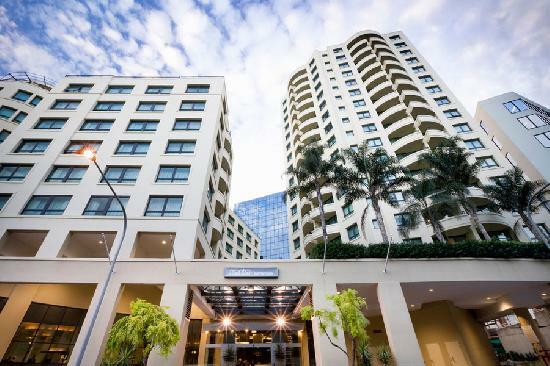 The hotel is located within minutes of Parramatta Railway Station and Westfield Shopping Centre. The longer you stay, the cheaper the rate. All types of travellers can take advantage of the discount accommodation at the Mantra Parramatta, as well as the range of modern amenities including lounge bar, business centre, conference centre, currency exchange services, direct internet access, disabled facilities, faxing facilities, guest laundry, gym & fitness equipment, lift, restaurant, room service, sauna, secretarial services, spa, outdoor swimming pool, tour desk, 24 hour reception, baby cots available, daily housekeeping and express check in/out. Other facilities include heated outdoor pool, spa, gym, sauna, turkish bath, under cover parking, ironing facilities, data port, 24 hour reception, room service and guest laundry, internet kiosk & conference room facilities for up to 200 guest, Restaurant & Bar. Nearby Attractions : Located close to Parramatta Westfield Shopping Centre, Parramatta Railway Station, Homebush Olympic Park, Parramatta Speedway, Rosehill Racecourse, Parramatta Stadium, Telstra Stadium, SuperDome, Eastern Creek Raceway, Local historical attractions & Parramatta River Cat and just 25 minutes from Sydney CBD. 1 Bedroom Queen Apartment : Sleeps up to 3 guests on 1 Queen Bed + Sofa Bed Extra. 1 Bedroom Queen Spa Apartment : Sleeps up to 3 guests on 1 Queen Bed + Sofa Bed Extra. Comfort Suite : Sleeps up to 3 guests on 1 King + Sofabed Extra. Executive King Spa Studio Apartment : Sleeps up to 3 guests on 1 King Bed + Sofa Bed Extra.